What is it? 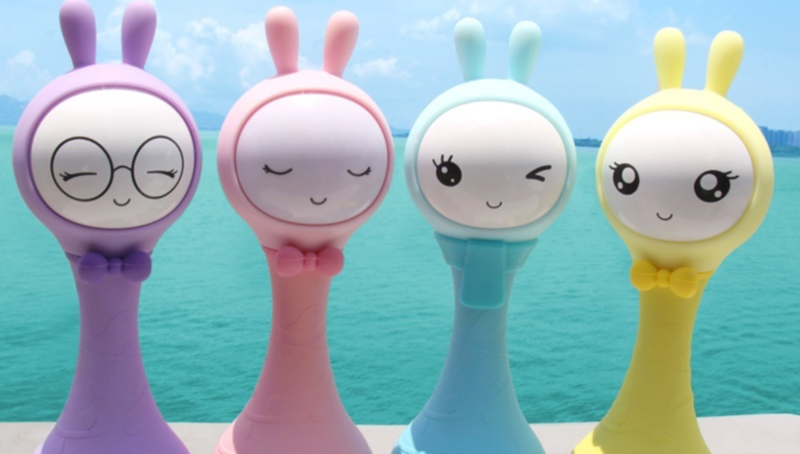 The Alilo Smarty Shake & Tell is an intelligent digital interactive player that offers children various songs, rhymes and sounds to keep them occupied and is a digital rattle with cute bunny ears. It is also able to identify and tell you the colours. The Alilo Smarty has developmental benefits which help a child grow by letting them learn to touch, play, listen and learning from the words and stories. They come in 4 different colours and designs which are all equally cute. -Color Identifying Technology - simply place Smarty over an object and press down lightly. Smarty's ears will then light up as that color and Smarty will also say that color. This works best with the 9 color cards included. -Soothing Music and Stories - in addition to the rattle sounds, Smarty comes preloaded with both popular songs and stories for kids. -LED Ears - Smarty has silicone ears that gently light up with different colors. The Alilo Smarty Shake & Tell Rattle is an easy-to-use interactive player and rattle which I'll recommend to parents with young babies and children. It is small and lightweight which will surely come in handy for outings and trips to keep our lil' ones entertaied. The colour-identifying technology was interesting especially for my toddler and she really had fun saying out the colours with the Smarty. It was easy for her to play with by simply placing and pressing the Alilo Smarty over the colour card and the rattle voices out the colour. We also sang along to the familiar nursery rhymes and even learnt new stories 'cuz there were so many to play from. To summarize, I really love how light and handy the Alilo Smarty is and packs so much into something tiny like that. Definitely one of my favorite toys to date. from Mums & Babes Sg today. How To Hide Your Post-partum Tummy! Parallel Import Prices, Worth The Risk?